Living art is the essence of Bonsai. The simplicity and elegance of a mature arrangement strikes a chord that resonates with serenity, artistic appreciation, and a long view of time. It’s an art form thousands of years old. Bonsai, meaning “tree in a tray,” is an artistic expression using live plants, which started in China sometime between 1,000-500 BC before moving on to Korea and Japan in the 12th century. Today, Bonsai is most associated with Japan and is a reflection of the Buddhist religion and the monks who spread the craft. Zen Buddhism focuses on simplicity and the desire to bring nature into everyday life and the religious reflection of peace, harmony, and balance. Bonsai is a living interpretation of those qualities. The development of more refined Chinese and Korean ceramics helped spread bonsai, as the plant and container are seen as having a synergistic relationship. Great care is taken in choosing just the right container to enhance each individual plant bonsai. 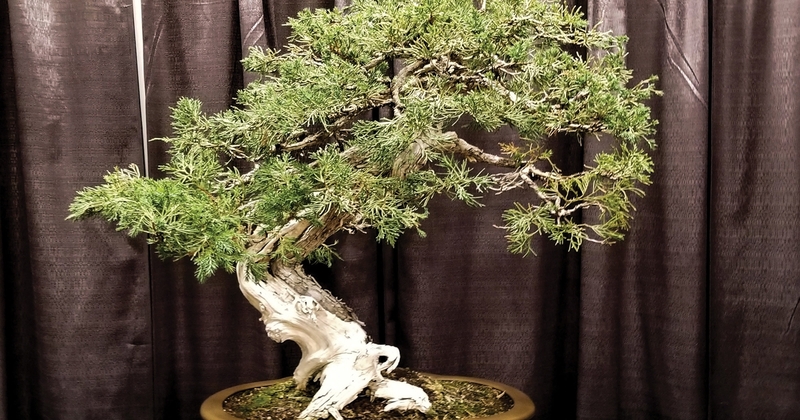 “The plant and container are seen as one,” explained Jon White of High Desert Bonsai in Star, Idaho. While most bonsai use trees, other woody-stemmed plants work as well. A short Google search will bring you to photos of amazing bonsai, many of which are blooming shrubs in addition to evergreen and deciduous trees. Much of what you see in mature bonsai has meaning. For example, age is often represented by exposed roots, scarred, gnarled branches, or broken and twisted trunks. Youth, in contrast, is often symbolized by straight, smooth tree trunks. White acknowledged that bonsai is living art and is best approached with an artists’ eye. Bonsai, is not for the impatient or for people who need immediate gratification. White said unfortunately, many commercially sold bonsai arrangements use outdoor trees sold as indoor plants. A good example of that is the common use of juniper in commercial big-box store bonsai. These outdoor trees often die quickly when kept in houses that are too hot with no normal fluctuation of temperature, moisture, and daylight. In addition, when the bonsai meets its new, uneducated owner, it often gets watered far too frequently said White. Trees don’t take well to soggy roots and quickly begin to sicken. So, what can the new owner of a bonsai do to keep their plant alive and healthy? According to White, the Boise Bonsai Society is a great place to find help, education, and like-minded plant-people. They have a monthly meeting that anyone can attend and also offer hands-on workshops. You don’t have to be a member to attend meetings, but workshops are for members only. Meetings are in Boise and by going to the society’s website, www.boisebonsai.com, you’ll find a complete calendar of events and meeting locations. In addition, there are tons of sources on the website to answer your questions about getting started. White has graciously provided a species-specific care sheet for dozens of plant varieties suitable for bonsai on the website as well. He said anybody at any age can succeed at bonsai. It’s a hands-on learning and art experience in which older members of the Boise Bonsai Society want to help foster a deeper understanding of the process by reaching out and coaching beginners. It’s important, White stressed, to come to a meeting before buying a plant. That way you won’t make costly mistakes like buying a tree or woody plant that won’t do well in our Intermountain West climate. While evergreens are commonly sold for bonsai, White said that deciduous trees are easiest for beginners. A Chinese elm from a nursery or online retailer is a good choice. The reason White recommends a deciduous tree for beginners is simple: the tree will start to show signs of stress, like leaf droop or drop, in time to change care practices before the tree dies. Evergreens, like junipers and pines, said White, don’t show distress until it’s too late to save them. The care of bonsai, including appropriate planting mix, fertilization and watering schedules based on plant species, pruning of new growth, and wiring limbs to form exotic shapes over time can produce “trees in a tray” that are astoundingly beautiful.